One of the best things you can do using a pendulum is clearing problems or snags in your life. Here's how to do this pendulum exercise. 1. Hold your pendulum in your dominant hand, letting it dangle while you visualize the problem you want to clear. 2. Ask your pendulum, "Can I, May I, Should I, clear this situation?" If you get a yes answer from your pendulum, then move forward. You can use an indicator plate with a circle that has yes on one side and no on the other to get this answer. 3. Begin swinging your pendulum in a counter clockwise direction, asking it to clear the situation. As you do this, "see" the situation resolving in your mind. Be very specific with your request and what you envision as to the situation being resolved. 4. Continue to focus on clearing the situation until your pendulum stops spinning in the counter clockwise direction. It will then either start moving along a vertical or horizontal axis, stop or start spinning clockwise. When it stops swinging on its own then the problem has been cleared. Once a problem has been cleared you can of course always choose to bring it back. Trust the power of your pendulum and your intent and release the problem from your consciousness. If you find it seeping back into your consciousness throughout the day, change your focus to something else. You can use this same pendulum exercise to clear repetitive thoughts that you find yourself having. Instead of visualizing a situation you want resolved just hold the repetitive thought in your mind and ask your pendulum to clear the thought from your life. After the process, you may still find the thought pop up in your mind occasionally, but it should appear far less frequently than before and eventually will disappear.....just like magic! You can learn to create and use your pendulum multiple ways in our Psychic Development ebook. 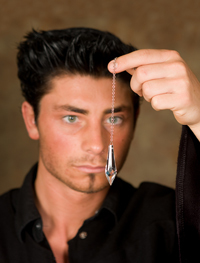 The pendulum is a great tool to add to your real magic toolbox. If you don't have a pendulum, check out the ones in the Esoteric School store.